Yesterday we used a printed fabric to help us learn some basic fabric coloring skills. Today we use our FABRIC FUN Fabric Markers to create our very own fabric designs. Creating your own custom fabric is so much fun! Before you begin a project it’s always a good idea to do a little test piece. Even a 4″ square can tell you a lot about how your fabric will behave. Always do your tester on a piece of the actual fabric you’ll be using. This gives you an opportunity to see how your colors will look and get the feel of how the fabric reacts. Some fabrics have more texture to them. Others may have a tighter or looser weave. 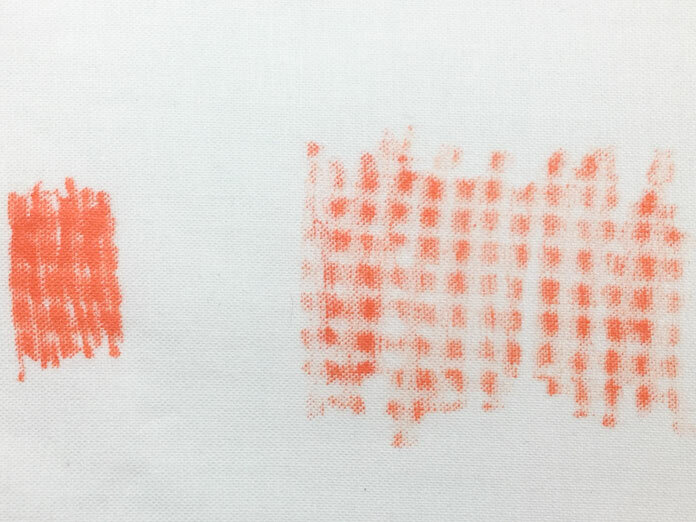 Your little test swatches will become mini works of art all on their own. Small test pieces allow you to gauge how the pens react to your chosen fabric. 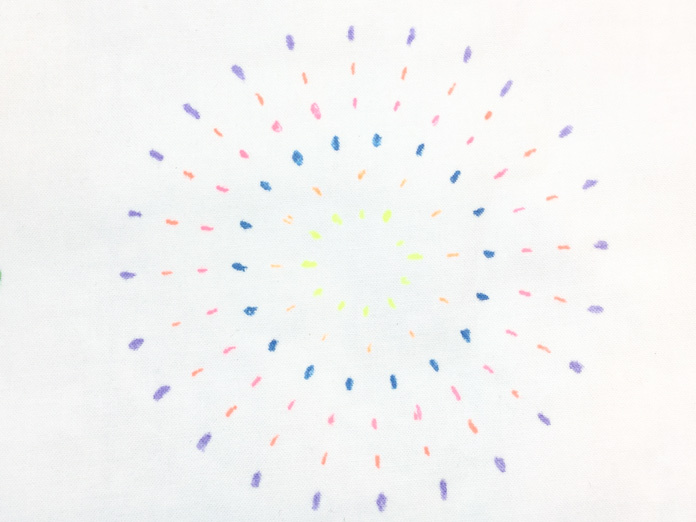 You can create a variety of special effects when creating your own fabric. Coloring individual sections of a design will keep your colors pure. Layering your colors on top of one another will blend the colors creating new ones. 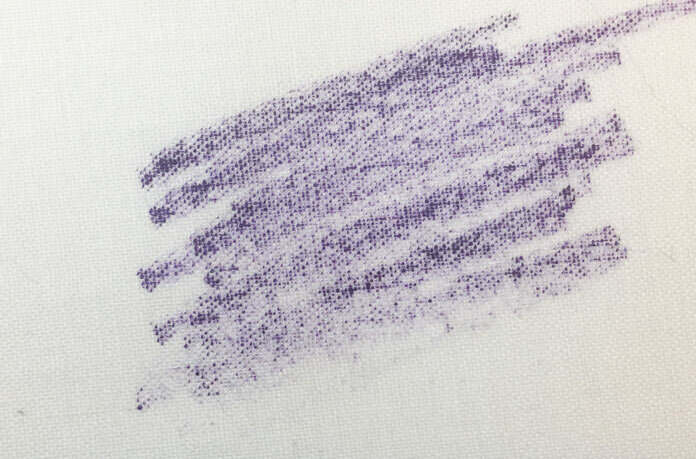 Fabric Fun Markers are extremely fast drying so there’s no risk of damaging the coloring tip when layering colors. 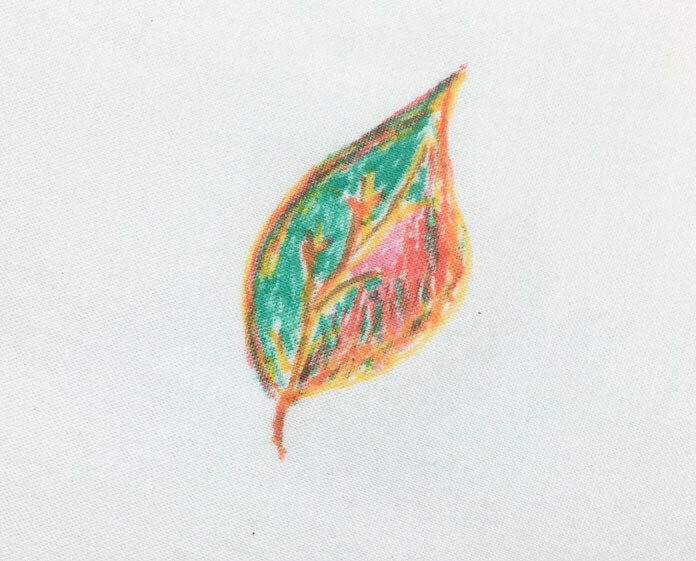 Both techniques have been used in this leaf. Layer colors on top of one another or separate the colors for two different effects. Another specialty technique is to put something that has texture underneath your fabric while you color. Try coloring with your pen upright as well as using the side just as if you were shading with the side of a pencil. Heavy grit sandpaper will give a subtle almost suede like texture. In the photo below, I used textured shelf liner. In the example on the left the pen has been used upright. In the example on the right the pen was used on its side. I really like these interesting effects. If you’re comfortable with your drawing skills then simply jump right in and draw directly on your fabric. The fabric does have a little more drag than paper because of the weave and cotton fibers. However, the stabilization techniques we learned in How to use FABRIC FUN Fabric Markers in your next quilting project, will minimize this issue. You can of course draw your design onto paper first. 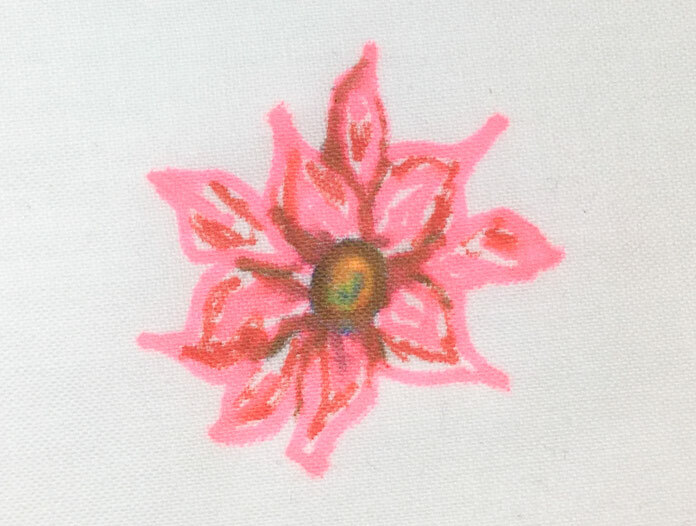 Use your drawing as a reference or transfer it to your fabric for coloring. I just use a regular pencil when using this method as the ink from your FABRIC FUN Fabric Markers will hide the pencil lines. I’m certainly not good at drawing but I sure have fun doodling on fabric! Fabric design does not have to be complicated. Simple geometric designs can be very effective. 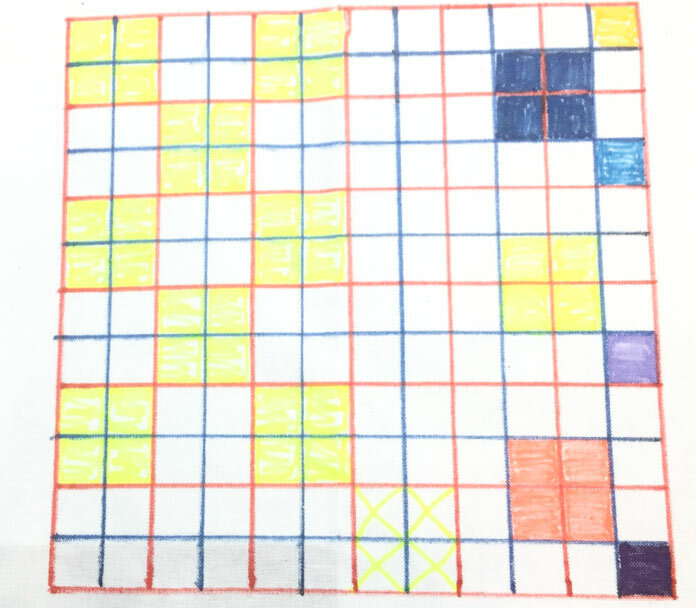 Even grids are fun! What could be simpler than drawing with a ruler and pen? For those who are just not comfortable with their own drawing skills there are plenty of tools available to give a helping hand. 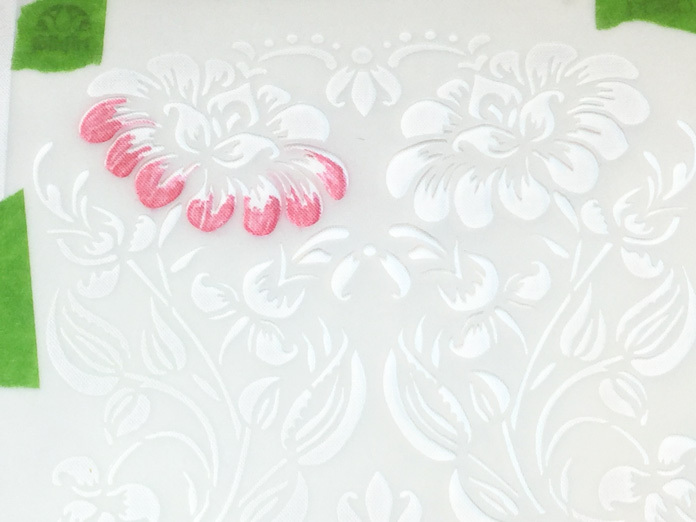 Stencils cut from a thin piece of plastic come in a huge variety of designs and sizes. Letters, numbers, words, celebratory, floral, animals, geometric… traditional, art deco, modern and more. 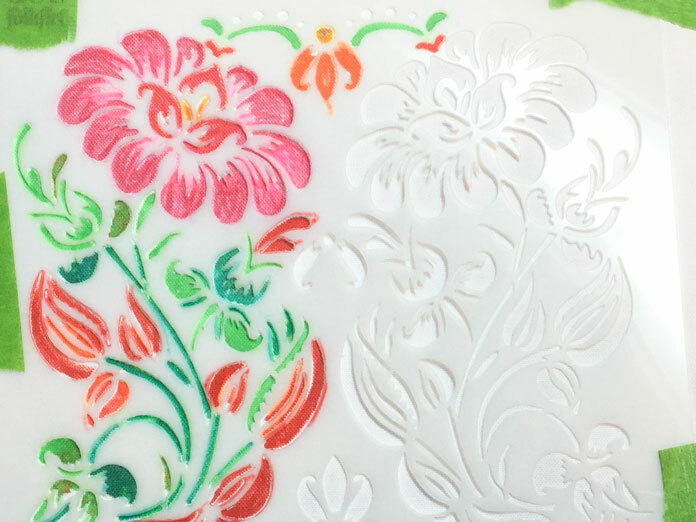 You can use the ones made for transferring quilting designs or the ones used for crafting and home decor. Simply tape the stencil on top of your stabilized fabric with painters tape and color away! Use painters tape to hold your stencil in place. You can color all of the stencil design or just small sections. Experiment with your colors until you get the effect that you want. You can color all of the design or just small sections. Many stencil designs lend themselves well to all over designs. Individual patterns are beautiful for use in quilts, pillows, bags and more. 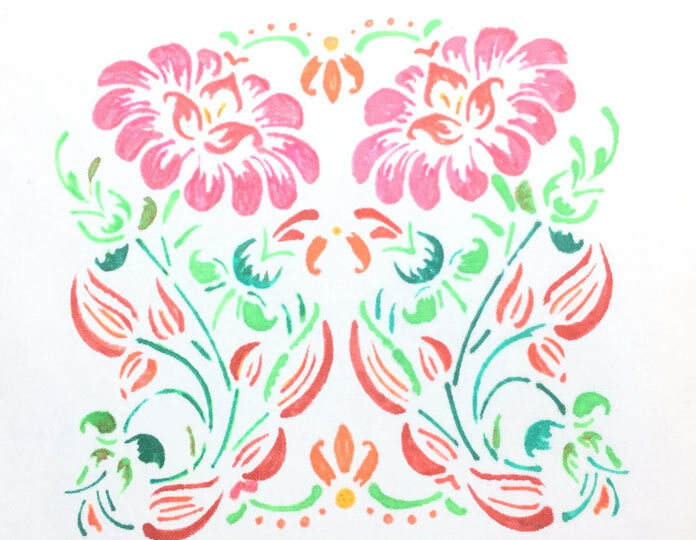 This colored stencil design would be beautiful used in a quilt. Another wonderful source of designs are adult coloring books. 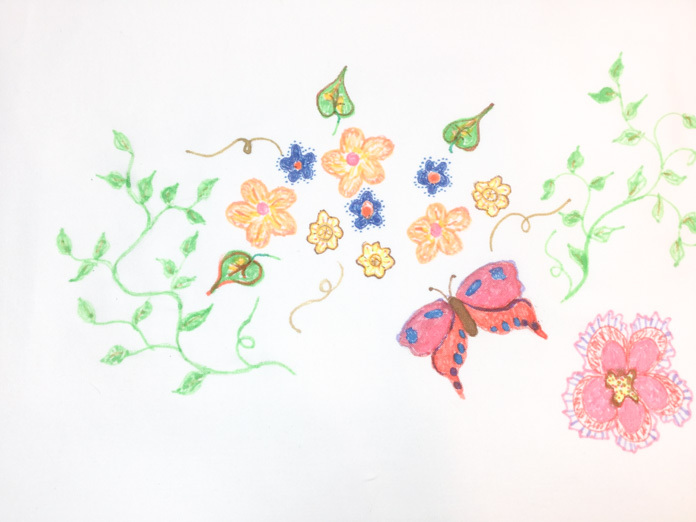 You could use these for inspiration to draw your own designs or just place a page under your fabric and trace the design. Tape your design page and fabric to a window or light box for easy visibility. 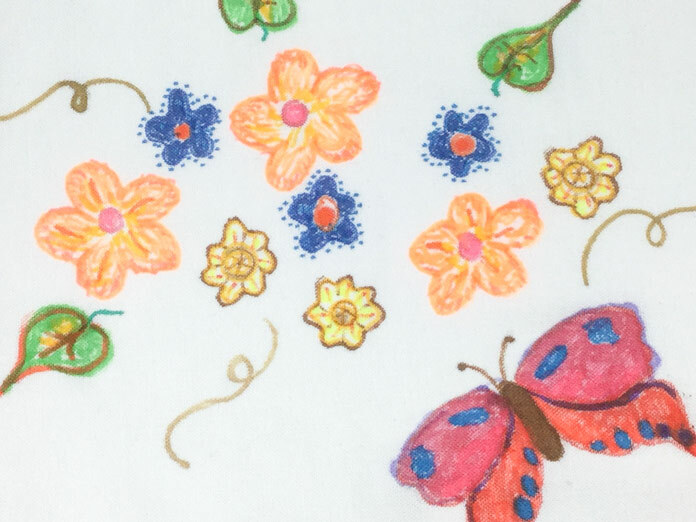 Their charming drawings can be preserved by transferring them to fabric. Better still give them their own fabric and FABRIC FUN Fabric Markers and let them draw along with you. 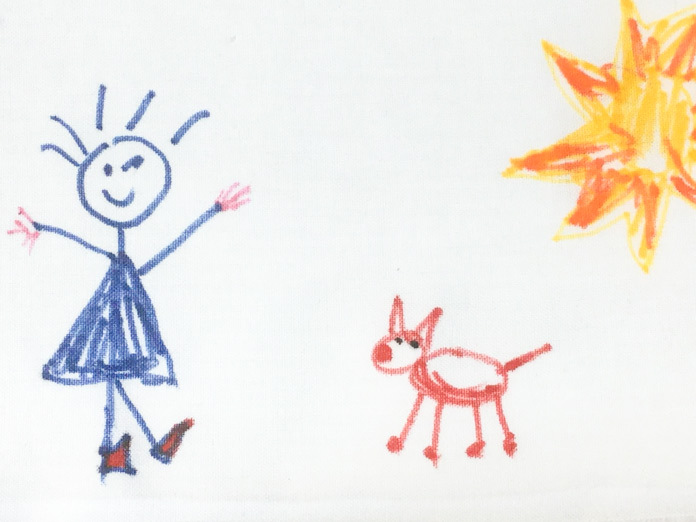 Children’s drawings can be preserved on fabric. The options for creating your own fabric are absolutely limitless. It’s no wonder that our pens are called FABRIC FUN! 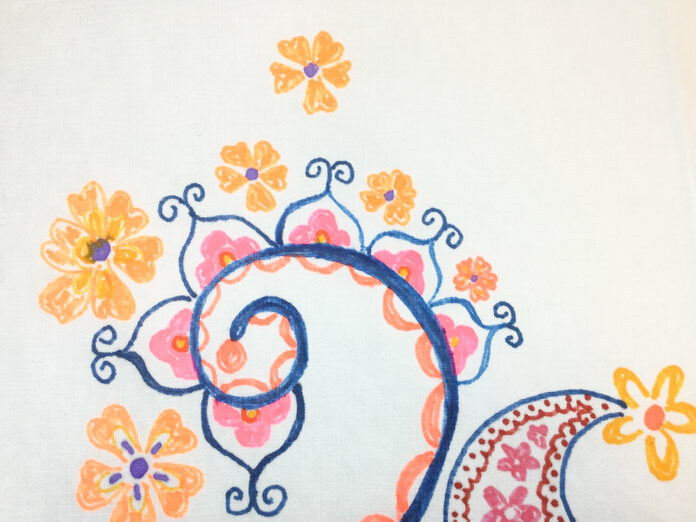 Join me again tomorrow when we explore yet another great way to use our FABRIC FUN Fabric Markers as we color our free motion quilting for the look of instant applique.